Your contribution is tax-deductible to the extent of the law (APSF Tax Identification Number 51-0287258). 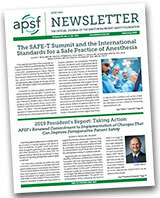 Contributions of $200.00 or greater are listed in the quarterly publications of the APSF Newsletter and on the APSF website. Click here to print a donor card. Did you know? APSF accepts stock donations. Every time you buy something on Amazon, APSF can benefit because APSF is now registered as an AmazonSmile Charitable Organization. 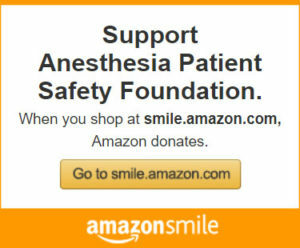 All you have to do is select Anesthesia Patient Safety Foundation as your AmazonSmile designee. Then, every time you make a purchase on AmazonSmile, the AmazonSmile Foundation will donate 0.5% of the purchase price to APSF from your eligible AmazonSmile purchases. As a result, APSF will receive a donation while you won’t pay any more and your vendor won’t receive any less than in an ordinary Amazon transaction. Yes, you use the same account on Amazon.com and AmazonSmile. Your shopping cart, Wish List, and other account settings are also the same. How do you select APSF to support when shopping on AmazonSmile? On your first visit to AmazonSmile at smile.amazon.com, you need to select Anesthesia Patient Safety Foundation to receive donations from eligible purchases before you begin shopping. Amazon will remember your selection, and then every eligible purchase you make at smile.amazon.com will result in a donation. Can you change your charity?